With the manga market hurting in recent years, Tokyopop along with other publishers have adopted the practice of bundling multiple volumes into one thick omnibus edition with a price tag reflecting that of two individual volumes. While this strategy is commendable and certainly easier on the wallet for the consumer, wouldn’t it make more sense to limit the properties licensed to those proven to be money movers? 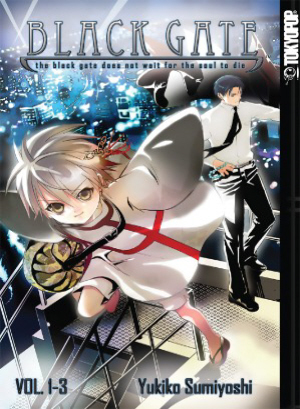 None-the-less, Black Gate is one of Tokyopop’s latest acquisitions and as such has been given the omnibus treatment to better sell it to readers who might otherwise have passed on the title. The series follows a group of individuals called Mitedamashi, supernaturally powered people tasked with closing black gates which are known for sucking away a person’s soul prematurely. Senju is one such Mitedamashi who juggles his spiritual responsibilities with that of his day job of selling air conditioners to make ends meet. However, a good chunk of his time is spent looking after Hijiri, a boy often in need of saving despite possessing powers of his own. The story is pretty straightforward causing it to lapse in repetitiveness from time to time. Multiple chapters perform the same premise of Senju closing gates while trying to earn a buck before Hijiri comes along and inevitably causes a ruckus. This doesn’t last however as the series takes a six year jump with the second volume to focus on Hijiri who has been training to become a Mitedamashi in his own right. From there, the story switches focus on Hijiri’s race to stop a serial killer who has been targeting Mitedamashi. The artwork is fairly bland and doesn’t really stand out in any way. There isn’t much detail to be had in the panels and the character designs are generic. On the other hand, panels are creatively positioned, grabbing hold of the reader’s attention. The pacing of the series feels off kilter for the first third of the volume, with the main plot seemingly heading nowhere. This changes when the focus shifts to Hijiri and for that reason, the omnibus format actually enhances the readability of the series as a whole. Had the volumes been published individually, the first volume’s lack of story progression and overly repetitive nature could have possibly driven readers away before the series had a chance to kick into high gear. As it stands, the omnibus format makes Black Gate more accessible. While the first volume does threaten to bog down the series, Black Gate’s potential shines through with the remaining two thirds of the volume. The switch in main protagonists from an adult who’s quite honestly a bore to a hyper active kid trying to overcome his shortcomings is a positive move in making the series more appealing to the readers of the shonen market. Though the title’s quality isn’t exactly top tier, there’s enough good spread between the volume’s 600 pages worth of story to justify its price tag.